With just a few days until the start of the new and debatably improved Kentucky Derby prep season, I thought it would be good time to review the juvenile scene as it stands now. Anyone familiar with following potential Derby hopefuls this early knows the list is anything but static given the high risk of defections and probability some 2013 Derby starters have yet to debut. Still, at this point last year many keen observers were already keeping an eye on eventual Derby and Preakness Winner I’ll Have Another, third place finisher Dullahan, Belmont winner Union Rags, and third-place Preakness finisher Creative Cause. Below is a list of juvenile colts who have shown potential to make noise along the Kentucky Derby prep path. They range from accomplished Grade 1 winners to mere maiden breakers. I realize the number of Todd Pletcher-trained runners is annoying, but there is nothing we can really do about it at this point. The guy dominated the Juvenile division at Saratoga and is absolutely loaded. After a troubled debut at Saratoga in July, Tizracer dusted the competition in his next start at Belmont in September where he won by over 10 lengths in a hand ride. 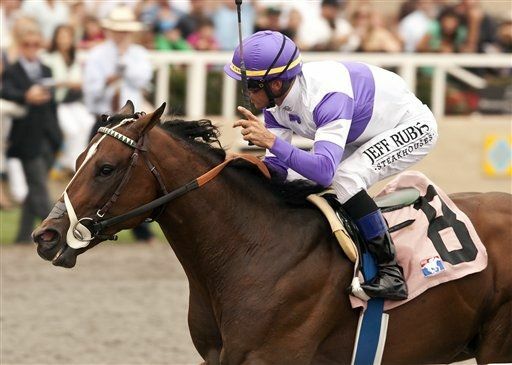 He will race next on polytrack at Keeneland in the Breeder’s Futurity (G1). He most likely would have stayed a Belmont for the Champagne, but was unfortunately put on the B-team of Pletcher’s juvenile brigade. Just missed breaking the track record in his debut win at Del Mar. His breeding is by no means regal. Precocious perhaps, but there are some signs of stamina in parts of pedigree. One start, one win on the turf at Saratoga. Even in training he sticks mostly to turf but you have to wonder if Brown will try dirt down the road. Distance is a question mark too, but handled 8.5 furlongs fine first time out. Arlington-Washington Futurity (G3) winner gets a mention due to automatic entry in Breeders’ Cup Juvenile. Third time (and switch to dirt) was the charm for Jocosity who blazed to a 7 1/2 length victory at Saratoga in early August. He earned the second-highest Beyer speed figure (95) of current juveniles for the effort. Stretching out is definite concern given breeding and running style. Even with headstrong antics before the start, Palace Malice gave the impression he could turn into a pro pretty fast in a professional effort at Saratoga. Bucked shins, which seems to be a recurring theme, will sideline him for awhile. His maiden win at Belmont was against a pedigree-strong field. Route distances could be a problem. Shug McGaughey’s decision to switch to dirt seemed to do the trick for this Saratoga maiden breaker at Saratoga. That victory was at 1 1/8 miles so distance should not be an issue for the son of Tiznow. He won’t race until 2013 due to hurting both back ankles.